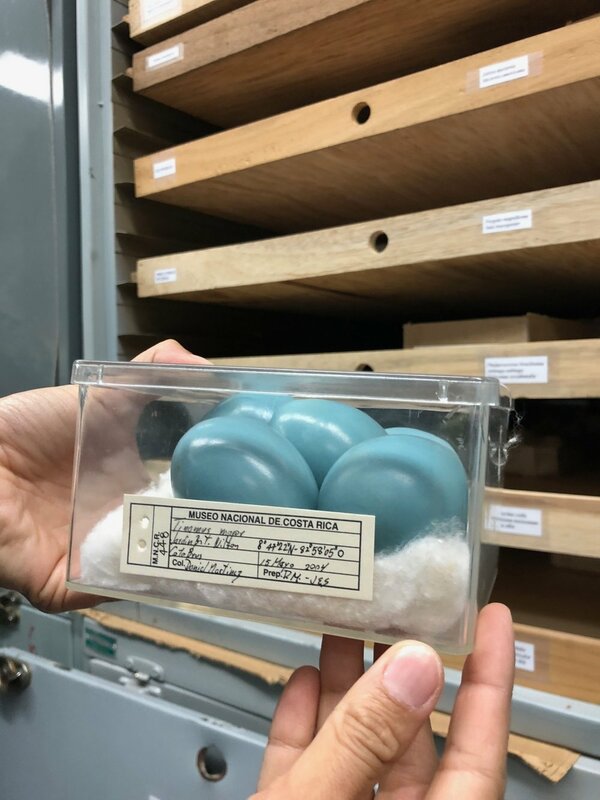 With Copenhagen Institute for Interaction Design in Partnership with the Natural History Museum of San Jose in Costa Rica, the course designed and taught by Yasaman Sheri, centers around Biodiversity, Biomaterials, Biotechnology and Ecology in Costa Rica. Costa Rica sets a special context for the recent advancements in biotechnology as it holds an incredible amount of world’s genetic diversity. In this week-long research studio, participants will review capabilities of biological tools advancing ever so rapidly, and explore frameworks for this new domain. You will have the chance to learn about systems and biological processes, such as grown material, bioreactors, and sampling instruments. You will conceptualize and materialize objects that propose new relationships with the natural systems in Costa Rica and connect with local institutions, facilities and have conversations with people that are knowledgeable about the local ecosystem. Prototypes will be presented in a public forum to act as prompts to enhance and facilitate conversations around social opportunities for bio-design. Learning expectations Advancements in biotechnology are changing the way we think about design materials and processes. They can be considered in designing interfaces and should be understood as a necessary design element, constraint, and opportunity. This workshop will review the state of the art in biotechnology tools, research in genetics, agricultural systems, biomaterials. In the context of a field trip through food plantations, materials production facilities, local rainforest, biotech labs and biodiversity institutions, we will learn to question and consider biology’s role in design. We will design devices for the interaction of holistic/playful — in anticipation of a near future where we are aware of and have agency over our living ecosystem. Virtual Reality (VR) and Augmented Reality (AR) are an expanding array of immersive technologies -- hardware, software, spatial sensors, cameras, interfaces, controllers, and head mounted displays (HMDs) that read and interpret the world, combine it with the virtual, and in the process, blur the boundary in-between. Through this complex layering of the real and virtual, the tangible and intangible, the person, their body, their brain, and their way of perceiving is place in the middle, somewhere new. They are in-between realities, in-between places, and in-between their real self and their virtual representation. Welcome to immersive living, a new type of “reality”. 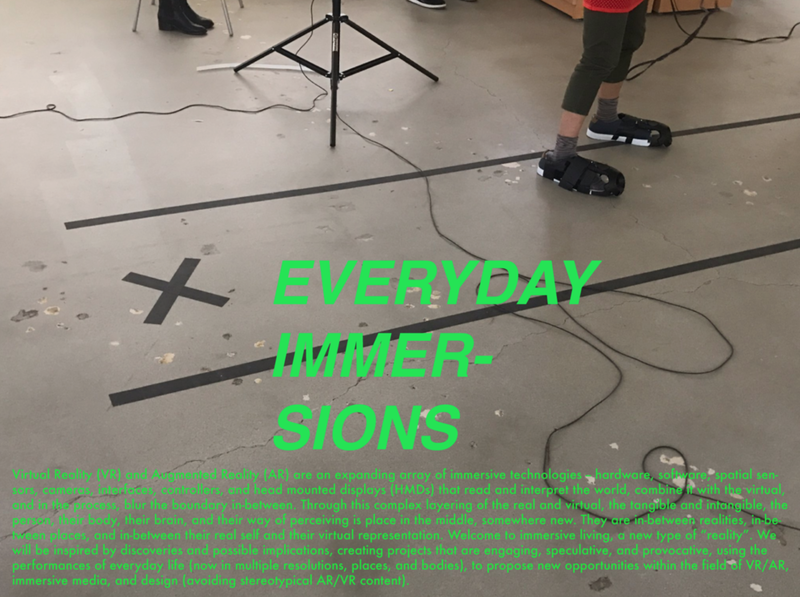 We will be inspired by discoveries and possible implications, creating projects that are engaging, speculative, and provocative, using the performances of everyday life (now in multiple resolutions, places, and bodies), to propose new opportunities within the field of VR/AR, immersive media, and design.